Lexus appointed itself a worthy task: Build a van, but give it the kind of opulence you’d normally associate with a limousine. The result—the Lexus LM 350—has debuted at the Shanghai Auto Show. Unfortunately, it looks as horrible and wonderful as the term “luxury van” sounds. We love it. How Is This Lexus LM Thingy Not a Toyota Alphard? 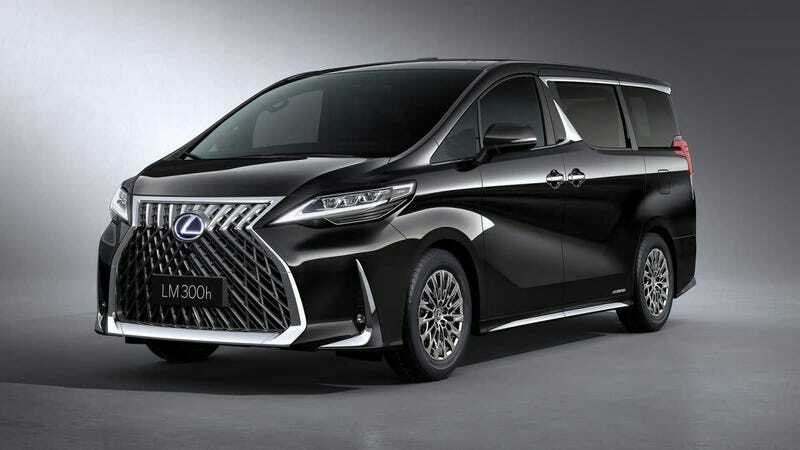 The teaser for the Lexus LM 350 was released last week, and it was rightly pointed out that it looks exactly like the Toyota Alphard. As it turns out, that’s exactly what it is: a Lexus-branded Alphard. We love the Alphard. This is brilliant. This is what a Toyota Alphard looks like. Really. This is genuinely a totally stock Toyota Alphard. Bask in it. In Asia, politicians, executives, and celebrities have been using the Toyota Alphard and the Toyota Vellfire (which is basically the same car, but “sportier,” somehow, as it’s still a minivan) as their preferred form of transit, Automotive News reports. It’s become more desirable than unwieldy limos or traditional three-box sedans, probably because it is so delightfully hideous, and people like to make a statement wherever they go. And with a market opening up for luxury vans, it only makes sense that Lexus would swoop in to meet the growing demand. Lexus is calling this a “multipurpose vehicle,” which seems like a questionable name to me given the fact that its purpose is, basically, chauffeuring rich people to their rich people destinations. Nevertheless, the LM is upping the ante when it comes to the fancy minivan. It’s taking the Alphard and outfitting it with a 26-inch television screen, a minifridge big enough for two bottles of champagne, umbrella storage, glass partitions, and massage chairs. It’s all the accoutrements of the traditional limo and/or big Lexus, but now in a van. A beautiful, horrible, van. If one of these doesn’t end up as a member of the Rolling Death Van Club, I’m going to be disappointed and make a point of changing that immediately. Compared to traditional luxury sedans, Lexus envisions a luxury MPV that can create a personal space that helps occupants perform better in business and also maximizes time when on the move. The four-seat configuration of the LM aims to create a rear seat experience unrivalled in the luxury vehicle ranks. It’s unlikely that we’ll see the Lexus LM make its way stateside any time soon. This is specifically being offered in China and a few other Asian markets—which makes sense, since that’s where the demand is. And this is probably just a wishful red herring, but Lexus did trademark the LM350 and LM300h (for the hybrid model, naturally) nameplates in the United States a little while back. And, we, too, here and now, are demanding our Lexus Alphard.